Today, I’m very excited to talk about a big milestone for us in Prismata development: our upcoming “Beta” release, which is now just around the corner! 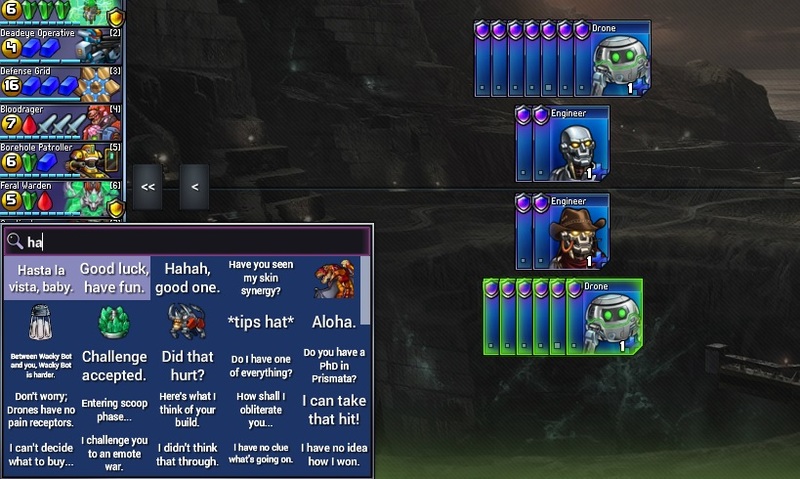 Also in today’s article… removing the lid on a few new Prismata features! 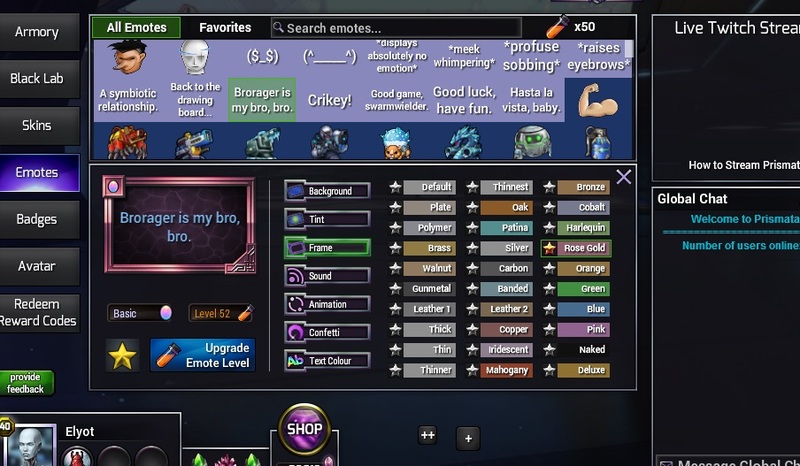 For all intents and purposes, you can think of “Beta” as an internal label that we at Lunarch are using to describe the last big update to the Prismata feature set that we’ll be deploying before the game’s wider launch on Steam. I’ve mentioned before that the term “Beta” no longer admits the industry-standard definition it once did. Traditionally, “Beta” meant feature complete, but that doesn’t really carry much weight for an online multiplayer game in the year 2016, since games like Prismata frequently receive fully planned content and feature updates well after launch. 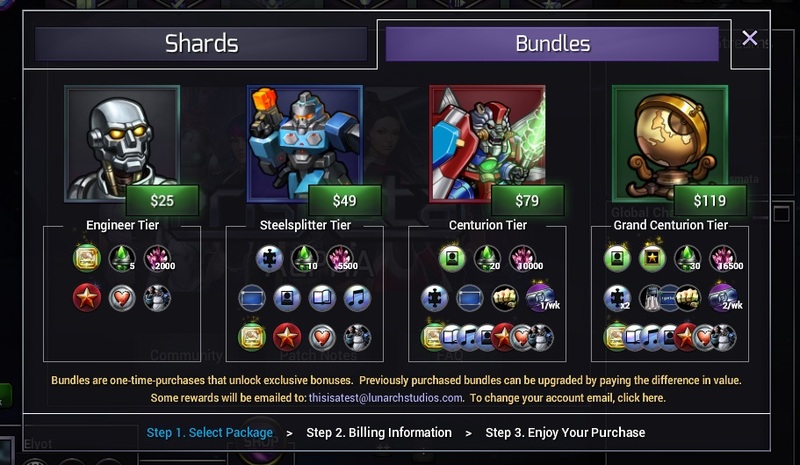 Bundles will be arriving in the in-game Prismata store, finally! Emote customization is pretty much the most amazing thing ever. You can now scroll through all of your emotes in game, with favourites at the top. It works for search results too. Wincer firing a helix of molten Drone slag. Not final. This is a broad category encompassing a bunch of TODOs left over from earlier work—stuff like animated skins behaving correctly in the menu screens, better HD-quality lobby graphics, fixes for our updater/installer, and so on. These are the type of tasks that can sometimes take a lot longer than expected due to unforeseen technical roadblocks. We always anticipate hitting a few; whether or not we finish ahead or behind schedule is mostly just a matter of how unlucky we get. The biggest setback so far was due to a huge number of problems we had with auto-updates on Windows. Nevertheless, those difficulties are probably counterbalanced by the fact that Steam integration seems to be going pretty smoothly so far. You win some, you lose some. We’re well into production on a bunch of never-before-seen new screens, menus, and narrative features for the campaign. In fact, we’ve had things like scripted “mission briefing” cutscenes for years, but we’re constantly improving them. I can’t wait to show this stuff off. It’s almost ready. The above four projects are what we deem necessary for Prismata to be sufficiently featured for the “Beta” label to be appropriate. At that point, most of our development effort shifts from being feature-focused to emphasizing content and polish. The milestone following Beta is one that we’re dubbing Steam Beta, in which we’ll be debuting Steam client support, Mac support, achievements (which will be available both inside and outside of Steam), as well as a few Steam-specific social and store-related features. In fact, several of our team members are already working toward this milestone. The milestone after that is Open Beta. 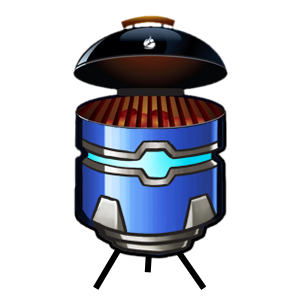 When we feel that our new user experience is as good as it can be, and we’re really confident that our servers can handle the volume, we’ll make Prismata available to the general public. At least, that’s the plan for now! We often get asked how development is going, and we still avoid giving exact dates because of how much uncertainty there is when it comes to technical challenges and creative processes, but I hope this look into our internal milestone planning has been informative. Next week, I’ll be leaking some new skins and more.